In recent years, a new system has been established for the development and realization of investment projects, with ministers and industry managers working at places across the country, ensuring the creation of new enterprises and permanent jobs. Numerous benefits and preferences have been introduced to improve the investment climate. Highest-level talks with heads of foreign states and international financial organizations, leading business representatives were held. About 700 investment agreements to attract dozens of billions of dollars to the country were signed. According to the 2019 Investment Program, capital investments in the amount of almost 14 billion US dollars are set to be realized for more than 3.2 thousand projects. In particular, it is envisaged to consume over 4 billion dollars of foreign direct investments. The meeting participants analyzed these investment projects in the context of industries and regions. Reports of managers of sectors on the activities undertaken were heard. Challenging aspects of projects that are lagging behind in implementation were discussed. As it was noted at the session, in the first quarter, the amount of funds planned for realization was fulfilled. Nonetheless, the situation in some industries and regions is far from reasonable. Heads of the Ministry for Development of Information Technologies and Communications, Uzavtosanoat Joint-Stock Company, Uzagrotechsanoat Holding and Uzeltechsanoat Association, deputy governors of Kashkadarya, Samarkand, Surkhandarya, Namangan, Fergana and Khorezm regions for investments received disciplinary warning. The Head of the state proposed to introduce a new control system to ensure the timely realization of investments. In accordance with it, all projects involving foreign direct investment would be divided into four lists to be monitored separately. The first directory will include 27 strategic projects designed to be implemented in the current year for 3.6 billion dollars of foreign investment. Their realization will be under the constant control of the President. The second catalog is to contain 65 major projects totaling 1.3 billion dollars, and their execution will be under Prime Minister’s control. Heads of central government agencies assigned to corresponding regions along with khokims are assigned with taking control over the execution of projects in the fourth listing. Regular discussion of the execution of investment projects and prompt resolution of emerging issues will be organized. The President drew attention to the availability of untapped opportunities for attracting foreign direct investments and cooperating with international financial institutions. The Head of the state noted the need for developing new investment projects in industries and regions. The Ministry of Investments and Foreign Trade was tasked with developing, jointly with interested ministries, additional investment projects for each district and city, taking into account the available potential and resources in the oil and gas, chemical, energy, mechanical and electrical engineering, building materials industries, as well as in the regions. Instruction was given to arrange business forums in Uzbekistan and abroad, hold presentations of domestic investors based on the formed proposals in conjunction with Uzbekistan’s embassies overseas. 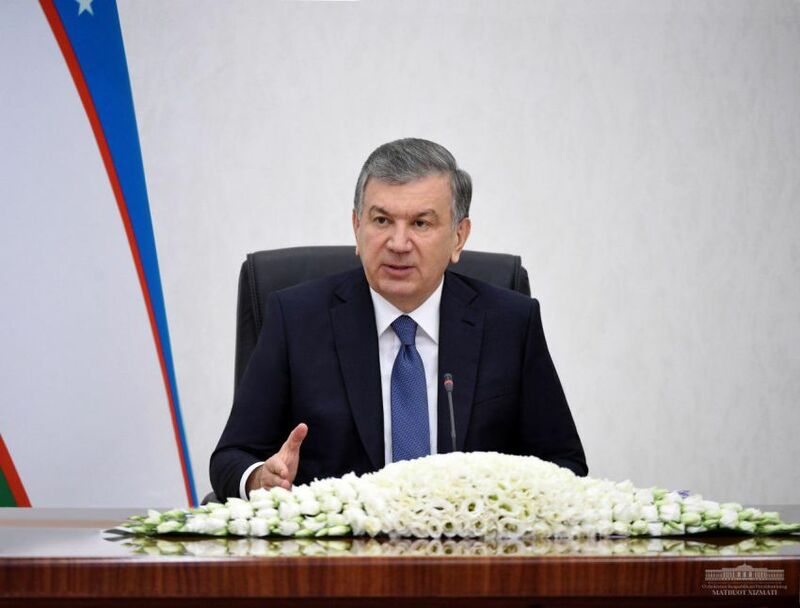 It is necessary to establish robust bonds with foreign investors who have expressed desire to work in Uzbekistan, help them from the start to the end of the project, in other words, hold them “by the hand” and ensure the expected result, said Shavkat Mirziyoyev. Activities on boosting the inflow of investments to Tashkent city, allocating land and state-owned facilities for investment projects were discussed at the meeting. It was noted that the capital city should set an example in attracting foreign direct investments. The need was noted for taking control over the execution of projects in industries and regions, securing the soonest launch of an electronic information system to quickly identify and address emerging problems. During the analysis of cooperation with international financial institutions, the importance of timely and qualitative implementation of projects in the social sphere was noted. It was indicated that works were late on 4 projects in the system of the Ministry of Health, 4 projects in the system of the Ministry of Water Management, 3 projects in the system of the Ministry of Housing and Public Utility Services. At the meeting, implementation of roadmaps approved following the visits at the highest level were also reviewed. The President noted that it is essential to ensure the rapid and consistent execution of measures provided for by the roadmaps and to bolster the activities of intergovernmental commissions in this direction. The Cabinet of Ministers was tasked with reviewing the composition of intergovernmental commissions based on the key areas of cooperation with every country. It was noted that starting from the next year, investment programs will be developed for a three-year period, and that all sectors and regions should launch appropriate preparations. Important tasks on the issues discussed at the meeting were outlined for the future.